For bathers who require maximum accessibility, an outward swing door Transfer Wheelchair Accessible Walk In Tub is the perfect choice. We offer a variety of models to suit your space. These wheelchair accessible walk in tubs can easily accommodate larger individuals or bathrooms. The Ella Transfer Wheelchair Accessible Walk In Tub was engineered to suit people who use a wheelchair and those with limited mobility. Bathers using a wheelchair can enter with ease from the side of the bathtub. The large entry through the wide, L-shaped outward swing door allows the bather to hold on to the deck- and wall-mounted pre-installed grab bars as they slide in or out of the walk-in tub bathtub. The Transfer Wheelchair Accessible Walk In Tub is made with a textured, slip-resistant floor, 1 U-shaped, deck-mounted grab bar, and 1 interior sidewall-mounted grab bar. A soothing experience awaits inside. The 22” wide molded seat lets you bathe in a comfortable upright position. You’ll have easy access to your choice of faucet, optional premium feature controls, and the pull-out hand shower for a convenient bathing experience. Check out our variety of packages including features like the exfoliating Infusion™ Microbubble Therapy, soothing air, hydro, or dual massagers, and more. Aluminum L shape outward swing door with gear and shaft 2 latch door lock mechanism to assure equal pressure on the door gasket and leakproof door seal. The L shape door opening allows for toilet clearance up to 21″ height and convenient transfer from the wheelchair into the seat over the soft and warm to touch acrylic shell. Our competition offers framed L shape doors making the slide in uncomfortably cold over a sharp aluminum frame. Our competition also offers a lever door lock system that allows only one latch vs. Ella 2 latch door lock. The door is attached to the shell so there is no cold or sharp aluminum door frame in contact with bathers body during the transfer or slide into the bathtub. That makes this transition into the seat for bather very comfortable and pleasant. The Ella Transfer Wheelchair Accessible Bathtub is designed for bathers who use a wheelchair or for those who simply need an easy-to-enter bathtub. With a barrier-free sidewall design, the bather can conveniently open the L-shaped aluminum door and slide into the bathtub. Strategically positioned air and hydro jets allow for a supremely relaxing experience. Two pre-installed grab bars allow for easier access and maneuverability. The longer Ella Transfer 60 Wheelchair Accessible Bathtub is a wider design for bathers who use a wheelchair or for those who simply need an easy-to-enter bathtub. 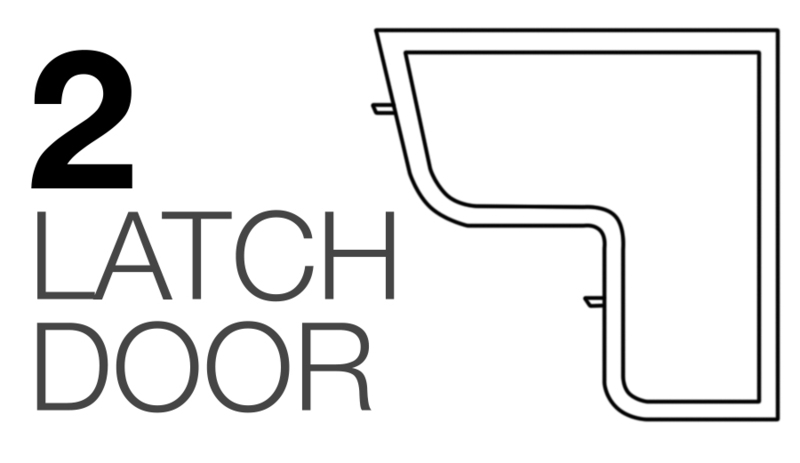 With a barrier-free sidewall design, the bather can conveniently open the L-shaped aluminum door and slide into the bathtub. Strategically positioned air and hydro jets allow for a supremely relaxing experience. Two pre-installed grab bars allow for easier access and maneuverability. The Ella Transfer 32 Wheelchair Accessible Bathtub is a wider design for bathers who use a wheelchair or for those who simply need an easy-to-enter bathtub. With a barrier-free sidewall design, the bather can conveniently open the L-shaped aluminum door and slide into the bathtub. Strategically positioned air and hydro jets allow for a supremely relaxing experience. Two pre-installed grab bars allow for easier access and maneuverability. The Ella Transfer26 Wheelchair Accessible Bathtub is designed for bathers who use a wheelchair or for those who simply need an easy-to-enter tub and a smaller width to fit in smaller bathrooms. With a barrier-free sidewall design, the bather can conveniently open the L-shaped aluminum door and slide into the bathtub. Strategically positioned air and hydro jets allow for a supremely relaxing experience. Two pre-installed grab bars allow for easier access and maneuverability. The Ella TransferXXXL Wheelchair Accessible Tub is our extra wide design for bathers who use a wheelchair or for those who simply need an easy-to-enter bathtub. With a barrier-free sidewall design, the bather can conveniently open the L-shaped aluminum door and slide into the bathtub. Strategically positioned air and hydro jets allow for a supremely relaxing experience. Two pre-installed grab bars allow for easier access and maneuverability.